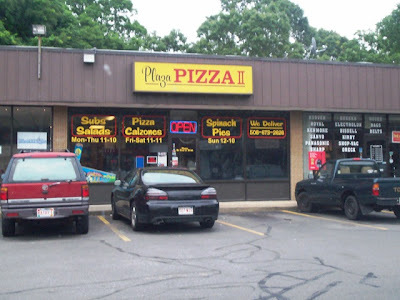 When I was working part-time at a store in the Swansea Mall a few years back, sometimes the girls and I would order in from Plaza Pizza II, located just across the street from the mall. Since most of the girls had fallen in love with their pizza - and the guys who delivered it - I got to taste a few different pies and topping combinations. I hadn't been to Plaza in years, so when Mom mentioned that she had read good things about their pizzas on the Internet, it was almost certain that we would be stopping by some time in the week. Well some time came today when Mom asked me to pick up an order after I got out of work. She called in the order - a large cheese, large chourico, and large veggie pizza - and they told her that it would be ready in about 20 minutes and the total would be $33.08. At 6 p.m., I pulled into the parking area. Before leaving, I asked the older gentleman behind the counter if he had a menu. He very politely handed me their list of available foods while I received my change from the younger worker. I managed to snap a photo of the soda coolers and few scattered booths (no tables) that were empty at the moment. 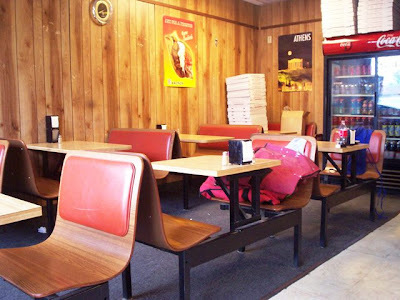 Although Plaza Pizza II does have seating, there really isn't much of it. I'm guessing that they have a large take-out and delivery business versus customers that stop by to eat inside. The interior isn't very glamorous - wood paneling and a few Greek-inspired posters - but the restaurant was very clean and the service was great, both on the phone and in person. Although the highway exit is located just ahead of the restaurant, I decided to drive down Route 6 since I spotted a huge traffic jam on I195 on the way up. I was home in about 10 minutes and was glad to see that all three pizzas were still piping hot. I brought them upstairs and Mom opened all the boxes to reveal the gorgeous pies inside. They looked and smelled amazing, and we couldn't wait to dig in. Mom and I let my father and sister choose what they wanted first because we know how impatient they can get (a.k.a, they're pigs and can't wait their turn, ha, ha). When we finally got a chance to get near the boxes, Mom grabbed a slice of cheese and a slice of chourico, and I grabbed the same plus a slice of veggie. The pizzas were so good! You can tell that they were homemade, and that only the freshest ingredients were used. In all our experience with pizza-eating, Mom and I have come to realize that Greek people make a mean pie. 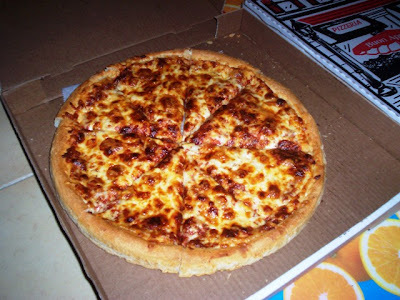 The cheese was perfect - not stringy and gooey - and the guys at Plaza were quite generous with the toppings. The crust had a nice crunch to it, and all in all we were happy with the amount of food we got for our money. Plaza Pizza II has a lot to offer. From grinders ($4.50-6.75) such as grilled chicken, roast beef, and chourico and chip, to pizzas ($6.26-14.25) like eggplant, BLT, and steak, everything on the menu sounds fantastic. 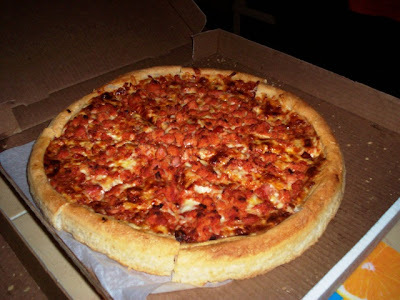 They even have a Chicago-style stuffed pizza ($12.75-16.25) with cheese, mushrooms, olives, pepperoni, sausage, and sauce. I'd love to try their spinach pies ($3) and I've heard good things about their grilled chicken salads ($6.25). They also feature Greek items like cold Syrian pockets and gyros ($5.50). Seafood is also available, but only on Fridays. 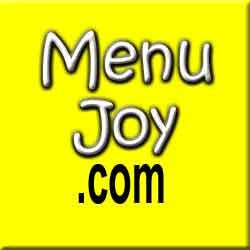 Mom read great things about their fish and chip platter ($7) and cannot wait to try it. Stuffed from eating all that pizza, Mom wrapped up the leftovers and put them in the fridge for us to have later on. 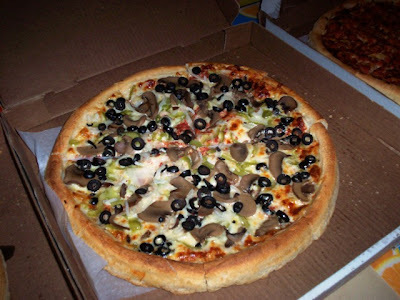 I am pleased to say that everyone in my family enjoyed our dinner from Plaza Pizza II, and the only downside is that we fall outside of their delivery area. Damn that Braga Bridge! Plaza Pizza II is open from 11 a.m. to 10 p.m. Monday through Thursday, 11 a.m. to 11 p.m. Friday and Saturday, and 12-10 p.m. on Sunday.